This post right here has inspired me to share this. I was privileged to speak to some children (10-12 yeas old) today. Sadly more than half of them want to loss weight. I was shocked. Cause from what I saw, none of them is actually over weight except perhaps “dem body remain for house sha” Really I am baffled by the question. Are kids not allowed to be chubby?Then they asked me for tips to loss weight. I simply said drink water, eat right (avoid late night meals and too much sweet things), eat plenty fruits & vegetables and exercise. Then they asked, aunty is that all? This weight loss nonsense is doing more harm than good. Thanks dear. The keto thing isn’t helping much. A dear sister was bed ridden for quite some time be cause of this keto thing all on the name of losing weight. Feeding right and exercises is enough trick. Keto is good but moderation is the key. It has its side effects and like you said exercise and healthy eating works like magic, but out dies not come easy. I have been on keto and fo it of and on. 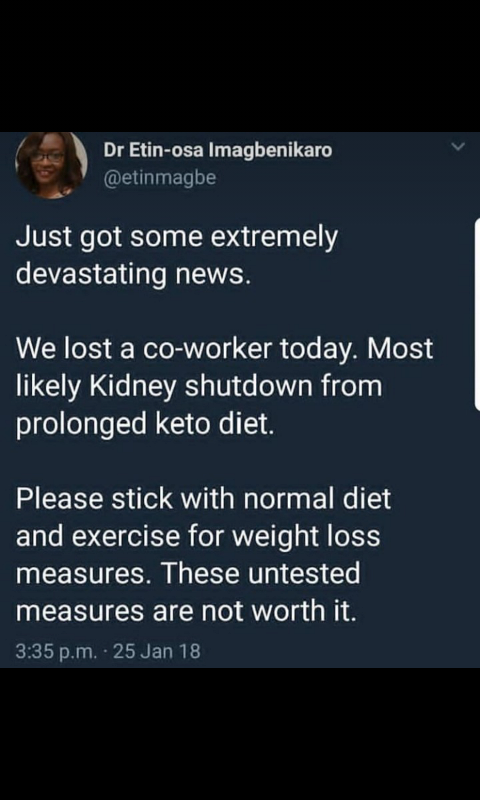 Keto had become a naija fad and even the so called advocates are cashing in on it. Eat right, exercise if you can and as my husband says “the African woman needs a bit of fresh in certain places. The struggle to loose weight is becoming more paramount these days. However, I believe that in the quest to achieve this, do not starve your body. Rather focus on eating to be healthy and fit. And watch the weight loss happen naturally. I know a few persons who have used various drink and end up harming themselves. Very true. I wish more people knew this. Thanks Debs for stopping by and contributing..
I’ll send u mail. do check out. can u plz give ur mail. I wanted to contact u or u contact me. wow! I had no idea it could be detrimental and I know a few people doing this. Kid equally want to loose weight? phew! If you don’t mind I nominated you for The Sunshine Blogger Award, kindly accept it by clicking the link https://wp.me/p2KeCs-me then you can nominate other bloggers too. I lost 50 pounds on Keto from February to July 2017.
. I am going to get back on it as soon as I can follow its daily requirements. It’s hard to get there but, when you get over the hump it is easier. July 2017, I found myself in the ER with a bowel blockage and when asked what the options were the doctor said they had one hour to get a team together and surgery was the only option. That was a horrible painful experience I hope I never have to go through again. October of 2017 I found myself again at the ER with a kidney stone blockage between bladder and kidney and also had surgery to resolve that. I have no idea if Keto had anything to do with the 2 surgeries in a 3 month span after never having any surgery my whole life except my tonsils taken out at 16. My neighbor who took me to the ER was concerned my diet had something todo with the bowel blockage but I believe the doctor did not think there was any cause from diet. I had success losing weight on keto and want to get back on it. If I have h lath problems again maybe or not Keto is a cause, I am not sure. Guys, guys, chill. Enough with the horror stories, those are the minority. I’m a teen, and I’ve been eating keto since I was 11. I’m 100% fine. The first few months I ate keto, I lost 5 pounds but after that, my weight has been consistent. Keto is most certainly not dangerous, and it can be lifesaving for diabetics. Wow. Natalie, i think the problem is most people over abuse keto. Maybe, that’s it. It could also be because switching back and forth between keto and non-keto can be damaging to your system. Great post, however! True. Thanks for the comments. https://www.youtube.com/watch?v=9r4QVE3cGkY I don’t believe Keto way of eating is a fad diet or something like that. I have started it this year, and it has been working great. I know this way of eating has been much better for me then my old style of eating. Carbs and sugar really are bad. A month after staying on this way of eating, I had to get off of all my diabetes medication, because the medication was causing my blood sugars to fall too low. Now I am still overweight (but it is getting lower), but my blood sugars have stabilized. @Tateman, awesome perspective. I don’t all together discredit Keto, my point is just that the use of Keto should not be abused. Plus in my part of the world, the people here are eccentric almost about every new thing or trend. I feel many don’t do the correct research on how to supply their body with the correct nutrients when eating low carb and just “wing” it. With any lifestyle change it’s important to be educated and decided if it’s right for you.